American Crafts Dear Lizzy Polka Dot Party & A Giveaway! Happy Monday everyone! 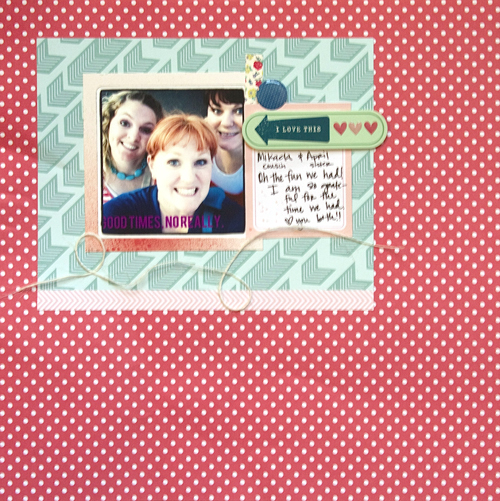 Today I am sharing American Crafts Dear Lizzy Polka Dot Party Collection with you. Now I am going to be completely honest, because hey it's how we do things here. I have never been a fan of the Dear Lizzy Collections. There is nothing wrong with them, it's just not my style. Very fluffy and pastel-y. So let's get started and see if I liked this line or not. -I liked the variety of patterns. There were arrows, polka dots (obviously) woodgrain and floral. A good mix. -The colors were a bit stronger than the norm, so i enjoyed that. There are random pencil scribbles through out the collection. It just really annoyed me. Again, it is just my opinion. Bottom Line: This was a strong collection that I did okay with. Not my style, but could totally be yours! What do you think? Is this a collection you would like to add to your stash? 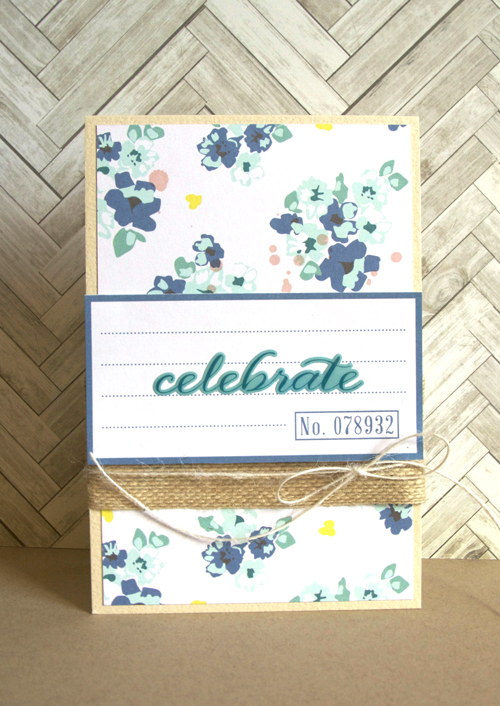 Leave a comment by midnight EST on Tuesday to be entered to win a Polka Dot Party Prize Pack! US residents only and please leave a way to be contacted if you win!! I love this collection. I could totally see myself using this. i love the navy blue floral! 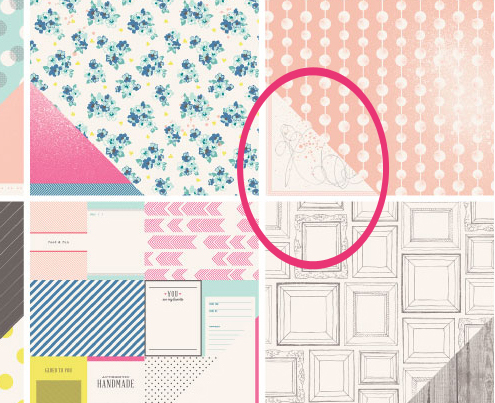 I love Dear Lizzy's new line....always want to scrap with it! I love Dear Lizzy products. They are always so cute, fresh, and easy to work with. Cute line but I do agree- random scribbles are a bit odd. 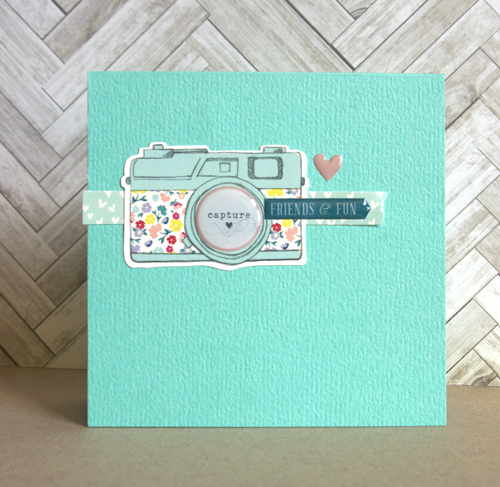 I frequently cover things like that up with journaling blocks or photos. Thanks for the chance! I love the colors of this line, really adorable! I agree that Dear Lizzy tends to be very pastel; I tend to be more a fan of the more graphic and bright AC Amy Tan lines. That said, I think Polka Dot Party is fun, and I like the variety of patterns - arrows and polka dots have made their way on to lots of my projects. I also like the mint color that shows up in the line, and the bowties too. I do like this line and can see me putting it to good use. Loving the looks of it-thanks for the chance to win it! Love how you used this collection and like that it's not too too girlie! Love the arrow patterns! Thanks for the chance to win! I really like the random scribbles. There is a DT out there who uses it a LOT and I love her style. So I think it's FUN! I agree with you. I wish designers would leave the patterns plain and not alter them with scribbles or other marks. I usually cove them up with embellishments, borders or journaling cards. I do love this line, especially the blue flower pattern. I am a Dear Lizzy fan, but agree about the random scribbles. Not my clean and simple aesthetic. I am the opposite, I absolutely love everything Dear Lizzy and would be overjoyed if I won this! I agree with you on the scribbles! I pretty much own a little bit from each of the Dear Lizzy lines. Her style is very similar to my own. Of all of her lines, Charming Charlie was my favorite. I didn't buy the entire line, but I got a few of the papers, and I only have a few scraps left at this point. I use up everything that she creates! So beautiful! Thanks for sharing your designs, so cute! I really like the colors! But I agree with you on the scribbles... I'd probably cover them up somehow. Thanks for the giveaway! Cute collection, would luv to try it. I don't own any Dear Lizzy but I think it would be fun to play with. I like the colors a lot. Thx for the chance. I like the polka dots, always have...and the strong colors! I have to agree with you about the random scribbles, strange! I love that you are able to be HONEST...but nicely!! Your projects are too cute!! This isn't really "my style" either...but sometimes that's fun to win something that is different than what you'd normally buy!! absolutely loving this collection! thanks for the chance! I love this new Dear Lizzy line! Love the fresh colors! I just laughed at what drove you crazy, because I have no doubt that would drive me crazy too! I haven't seen this in person, but even the photo where you circled the scribbles . . . seems odd! CUTE stuff though! I usually love the Dear Lizzy collections! A little more girly and softer in color than what I usually love, but very usable and pretty nonetheless!! !